More than 230 NSW students on Monday received scholarships valued at $600,000 from the Public Education Foundation to help them reach their potential and expand learning and professional pathways. Zarni Tun walks with crutches and uses a wheelchair, but that hasn’t stopped him climbing Mount Kosciusko, excelling as a rower and starting an environmental science degree at university. On Monday Zarni received a university scholarship from the Walter and Eliza Trust at the Proudly Public! Celebrating Excellence in Public Schools awards night at Sydney Town Hall. He will use his scholarship to buy a new laptop to further his interest in music and photography and fund field trips and textbooks. Zarni’s cerebral palsy affects his legs and upper body “but I like to be as independent as possible”, he said. Climbing 9 km up Mount Kosciusko on crutches last year has been one of his biggest challenges, but he made it and raised $11,000 for the Cerebral Palsy Alliance. “I just pushed myself. I said to myself: ‘You can do this’,” he said. “When I reached the peak I was exhausted and sore but it was an amazing and beautiful achievement to share with other people with cerebral palsy. Zarni completed high school at Sydney Secondary College, Blackwattle Bay campus, which he credits with giving him the inspiration and encouragement to succeed in education. Education Minister Rob Stokes, who awarded the scholarships, said Zarni was a role model for other high achievers to follow. Now at the University of Technology, Sydney, in the first year of an environmental science degree, Zarni hopes to work in developing countries. “I’ve travelled with my parents [mother from Thailand and father from Myanmar] and it’s really opened up my eyes about how important education is in developing countries and how lucky I’ve been to get such a good education,” he said. The Secretary of the Department of Education, Mark Scott, said the Public Education Foundation scholarships provided financial assistance to the recipients and acknowledged their dedication and commitment to the public education system. “These scholarships are about recognising and rewarding student excellence to encourage high-achieving students to continue to maximise their potential,” Mr Scott said. The Public Education Foundation is a charity dedicated to enhancing the value and reputation of public education by providing life-changing scholarships to its students, teachers and principals. 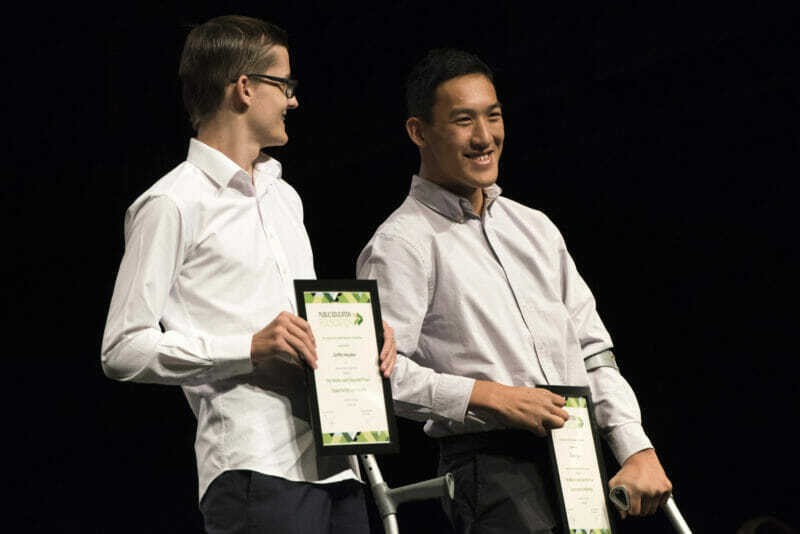 The awards night was sponsored by the NSW Teachers Federation, the NSW Department of Education, Teachers Health, First State Super, and the Teachers Mutual Bank. Support is also provided by the Harding Miller Education Foundation, City of Sydney, Australian Council of State School Organisations, the NSW Secondary Principals Council, the NSW Primary Principals Association and the NSW P&C Federation. Thanks to the NSW Department of Education for this story.